Preview Date & Times: Preview day is February 11, 2019 with a time prearranged with Bidilla, Inc, in advance. Appointments must be made prior to February 8, 2019 at 3PM CT. Preview appointments can be made by calling 770-322-4507 or by email at info@bidilla.com. Checkout Date & Times: All items are to be picked up by the buyer on February 20th, 2019 from BY APPOINTMENT, after full payment of the invoice and verification of funds See Terms & Conditions for more details. BIDDER TERMS & CONDITIONS: PLACING A BID AT THIS AUCTION, SIGNIFIES YOUR AGREEMENT TO THE FOLLOWING TERMS & CONDITIONS Any reference to this sale as an auction shall be construed as to mean a segment of an ongoing online auction for this entity. Therefore the word "auction" contained herein, refers to an auction segment in a series of auction segments controlled by a master online auction contract for the seller. Bidilla, Inc. is contracted by the seller to sell the items subject to this sale, and is not itself the owner of any of these items. BIDILLA, INC. 336 E College AVE, STE 206 Tallahassee, FL 32301 HTTP://WWW.BIDILLA.COM info@bidilla.com FL AB3574 PRINCIPAL AUCTIONEER: Jeffrey Butirro, GPPA FL AU4361, FL AB3574, GA AU4107 BUYER'S PREMIUM: 10% SALES TAX: Varies - Tax will apply to the total invoice, including Buyer's Premium. Tax is subject to the tax rate where the vehicle is to be registered. PAYMENT DUE DATE: February 19, 2019, hereinafter referred to as PAYMENT DUE DATE, is the final date we will accept payment for your invoice. Please see below for payment instructions. PICKUP DATE(s) & TIME(s): February 20, 2019, hereinafter referred to as PICKUP DATE, are the actual dates scheduled for you to pick up your purchased items. If you cannot make these pickup dates, contact us PRIOR TO BIDDING to see if there is any flexibility. For pickup instructions, please see below. PREVIEW DATE(s) & TIME(s): February 11, 2019 with a prearranged appointment by calling 770-322-4507 or email info@bidilla.com. CHECKOUT DATE & TIME: PAYMENT IS DUE IMMEDIATELY FOLLOWING THE AUCTION. You will receive an invoice at the email you have on file with Proxibid®, from invoices.globalauctionservices@gmail.com, with the name "Bidilla Inc. Auction Invoices - DO NOT REPLY". Bidilla, Inc. will do its best to get invoices emailed to you the day of the auction. However, late running auctions may cause a delay in receiving your invoice to the next business day. AUCTION LOCATION: Online Only - Items are located at: 2798 Goodwin Ave, Crestview, FL 32539 PARTICIPATION REQUIREMENTS: Valid Credit Card required for bidding approval PAYMENT OPTIONS: Wire Transfer, Credit Cards will only be accepted for invoices (including Buyer's Premium and Sales Tax) that are below $500.00 Payment Instructions: A valid Credit Card is required for registration. A 10% Buyer's Premium will be added to the High Bid Price at close of Auction to determine Final Price. Sales Tax will be added to each invoice. Licensed Auto Dealers must provide a copy of their Automobile Dealer License and Sales Tax Registration Certificate prior to each auction, along with a certification that the vehicles purchased are for resale purposes to have sales tax removed. All invoices must be fully paid by the PAYMENT DUE DATE. Wiring instructions will be sent to the winning bidder in the email with the invoice, if the total invoice is $500.01 or more. If the total invoice is $500.00 or less, we will charge the invoice amount to the Credit Card on file with Proxibid® through Auction Payment Network (APN), and you will receive a "Paid in Full" invoice with pickup instructions. If the total invoice is $500.00 or less and we are unable to utilize the Credit Card on file with Proxibid®, an unpaid invoice will be emailed to the email address on file with Proxibid®, along with instructions and a phone number for payment. It is the winning bidder's responsibility to make sure all invoices are paid by the PAYMENT DUE DATE. ALL items (vehicles or otherwise) invoiced to a bidder must be paid for prior to the bidder removing ANY of the items. If Full Payment is not received by 5PM Eastern on PAYMENT DUE DATE, the winning bidder will have their bidding privileges revoked from us and a dispute will be entered into the Proxibid® platform. Once a dispute is filed the auction is closed. FOREIGN BUYERS: Wire Transfer Currency Type: USD ITEM PICKUP: Bidder is responsible for having vehicles towed off the property. NO VEHICLES ARE TO BE DRIVEN OFF THE PROPERTY. All items are to be picked up by the buyer on PICKUP DATE, after full payment of the invoice and verification of funds. No party, other than Bidilla, Inc. is authorized to release any item sold at this auction. ALL ITEMS MUST BE PICKED UP BY PICKUP DATE. THERE ARE NO EXCEPTIONS TO THIS. ANY ITEM REMAINING AFTER PICKUP DATE WILL BE CONSIDERED ABANDONED PROPERTY. NO REFUNDS WILL BE GIVEN ON ABANDONED PROPERTY. SPECIAL TERMS OF SALE: BUYER PAYS ALL COSTS FOR TAX, TAG, AND TITLE TRANSFER YOUR PURCHASE IS NOT CONTINGENT UPON FINANCING. DO NOT BID UNLESS YOU HAVE THE FUNDS TO PAY FOR YOUR PURCHASE ALL VEHICLES SOLD "AS IS - WHERE IS" WITH NO WARRANTY EXPRESSED OR IMPLIED BIDDING: Bidding on a vehicle will be considered sufficient evidence that a bidder accepts all conditions set forth in these BIDDER TERMS & CONDITIONS. The Auctioneer has the authority to accept or reject any or all bids. The Auctioneer's decisions are final. BIDDER AGREEMENT: In the event that you are the high bidder, by the act of bidding you hereby agree to purchase the Vehicle(s) for the total purchase amount of the last (high) bid plus the buyer's premium plus all taxes. You further agree that ANY STOP PAYMENT OF A CHECK OR WIRE TRANSFER, STOP PAYMENT ON YOUR CHARGE CARD, OR GIVING A CHECK THAT IS RETURNED FOR INSUFFICIENT FUNDS SHALL BE IN ITSELF PRIMA FACIE EVIDENCE OF FRAUD EXISTING AT THE TIME THE OF THE TRANSACTION; EITHER OF THESE ACTIONS SHALL BE CONSTRUED BY THE PARTIES AS AN INTENT TO DEFRAUD IN ORDER TO CONSUMMATE THE TRANSACTION. You also agree that Bidilla, Inc. is entitled to receive any and all fees or commissions outlined in these Terms & Conditions, on any vehicle sold, due to or presented at an auction event, and up to 30 days thereafter. MERCHANDISE: All vehicles are sold "As-is, Where-is" with no warranty express or implied. We do our best in describing vehicles. However, no items are guaranteed. Time will be made available prior to each Auction Segment for a preview of the vehicles to be sold. It is the buyer's responsibility to carefully inspect the vehicles prior to the Auction Segment. Most vehicles offered for sale are used and may contain defects not immediately detectable. Bidders are encouraged to inspect the vehicles prior to bidding. Mechanic inspections may be arranged by appointment. Otherwise, bidders must adhere to the inspection dates and times indicated in the item description. ALL SALES ARE FINAL. There is no "Cooling Off Period." If you are the high bidder, ownership changes hands immediately upon the auctioneer, or online bidding platform saying "SOLD". At that point, you own the vehicle and are responsible for payment in full. Bidilla, Inc. is not responsible for lost, stolen or damaged vehicles. DESCRIPTIONS AND PHOTOGRAPHS: Vehicle descriptions or photographs are not to be used in lieu of a personal inspection. Information provided in descriptions are from sources deemed reliable, but are not guaranteed. Bidders are encouraged to inspect the vehicles. Vehicle history report services are provided by many companies and are available via the internet. Bidders are responsible for deciding whether or not to purchase a vehicle history report. RETURNS: All vehicle sales are final. No returns will be accepted. DEFAULT OF PURCHASER: In the event that the auction is closed with a defaulting purchaser, in addition to asserting all remedies available by law, Bidilla, Inc. may take any or all of the following actions: the cancellation of the sale, holding the defaulting purchaser liable for the purchase price, retaining as liquidated damages any payment made by the defaulting purchaser, reselling the vehicle(s) without reserve at public auction, privately selling the vehicle(s) after giving seven (7) days' notice to the defaulting purchaser, or by taking other action(s) that Bidilla, Inc. deems necessary or appropriate. If Bidilla, Inc. resells the vehicle(s), the original defaulting purchaser shall be liable for the payment of any deficiency in the purchase price and all costs and expenses, including storage, the expense of both sales, reasonable attorney's fees, commission, incidental damage, and all charges or fees due. In the event that such purchaser pays a portion of the purchase price for any or all vehicles purchased, Bidilla, Inc. shall apply the payment received to such vehicle(s) that Bidilla, Inc., in its sole discretion, deems appropriate. Any defaulting purchaser will be deemed to have granted Bidilla, Inc. a security interest in, the vehicle(s). Bidilla, Inc. may retain as collateral security for the obligations of the defaulting purchaser to Bidilla, Inc. any property in Bidilla, Inc.'s possession owned by such a defaulting purchaser. Bidilla, Inc. shall have benefit of all rights of a secured party under the Uniform Commercial Code adopted in the state of Florida, or in the state where the auction is held (if other than Florida). REGISTRATION: Registration is required in order to bid at any Bidilla, Inc. Auction. This registration includes your name, address, phone number, email address, state issued Identification or Driver's License. Since the act of bidding at an Auction creates a binding contract, the giving of false registration information may constitute an act of fraud. INVOICING OF VEHICLES PURCHASED WILL BE DONE ACCORDING TO THE INFORMATION GIVEN TO US AT THE TIME OF REGISTRATION - NO EXCEPTIONS. BY REGISTERING TO BID, YOU CERTIFY THAT YOU UNDERSTAND THAT YOU ARE THE PURCHASER OF ANY WINNING BID MADE WITH YOUR BIDDER NUMBER. By registering to bid you also agree to be added to our email list, you do have the option to opt-out after you receive the first email. REMOVAL OF LOTS FROM A SALE: Bidilla, Inc. will make all reasonable efforts to have all vehicles advertised, available for sale. However, there may come an occasion that a vehicle must be removed from the sale. Bidilla, Inc. assumes no liability for damages incurred by the removal of an item from a sale. RESERVE: Some vehicles may be sold with a Reserve or Minimum Bid. If a vehicle is offered with a reserve, the auctioneer may bid on behalf of the seller until the reserve is met. If the reserve is not met, Bidilla, Inc. will submit the highest actual bid as an "offer" to the seller for their acceptance. ONLINE BIDDING: Using an online bidding service, a bidder must in addition to accepting and following the terms outlined herein, accept and follow the Terms & Conditions set forth by the online bidding service. Bidilla, Inc. assumes no liability for damages incurred by the failure or disruption of online services. LIABILITY: By Bidding, the Bidder agrees to hold Bidilla, Inc. and the Auctioneer harmless for errors & omissions. Further, the Bidder agrees to hold Bidilla, Inc. and the Auctioneer harmless, as agents of the seller, for issues arising from the transfer of title of goods purchased. EMPLOYEES & ASSOCIATES: Employees and associates of Bidilla, Inc. are permitted to purchase vehicles at competitive bidding under the same terms, rules and regulations as the general public. DISPUTES: Should any dispute arise after the sale, the auctioneer's records shall be conclusive in all respects. ARBITRATION: In the event that a dispute arises from an Auction under the terms herein, the Bidder agrees to resolve the dispute through Binding Arbitration, whereby the prevailing party is entitled to reimbursement of their legal fees by the opposing party. LITIGATION: Any litigation brought forward by bidder/purchaser will be against seller. Bidilla, Inc. is merely performing an auction service, and does not own the property. Upon litigation, bidder/purchaser will not be entitled recovery of fees earned by Bidilla, Inc. duly performing its service. VENUE: By bidding in this auction the bidder agrees that the contract created by these conditions of sale is made and performed in the county and state where the items are located. Any dispute arising from this auction will be resolved in, and under the laws of the County and State where the Auction was conducted. SEVERABILITY: The Bidder agrees that if any portion of these terms is deemed unenforceable or invalid, the remainder of the terms shall remain enforceable and valid. 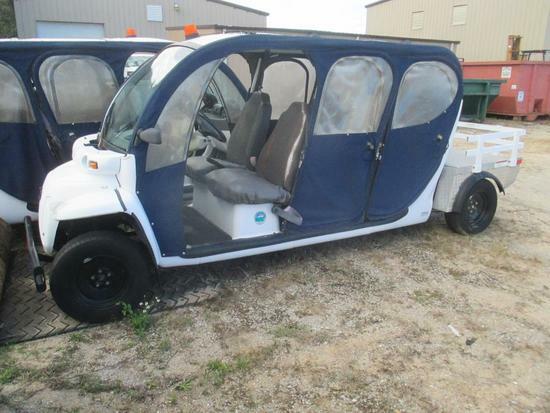 Year: 2008, Make: GEM, Model: Low Speed Vehicle, Trim: Golf Cart, VIN#: 5ASAG674X8F048055, Mileage: Unknown, Color: White, Engine: Electric Motor, 72 Volts, Fuel: Battery...more, Transmission: Automatic, Brakes: Unknown, 6 Capacity, No Charger. 2 Fans Missing Right Headlight, Seat Torn. Odometer may no be accurate. May have defects not easily noticed on a quick inspection. Sold As Is Where Is with No Warranties Expressed or Implied. By Bidding on this item you are agreeing to, and accepting the terms & conditions of this auction. These can be found under the special terms of sale, by clicking the "Terms of Sale" above. Year: 2008, Make: GEM, Model: Low Speed Vehicle, Trim: Golf Cart, VIN#: 5ASAG67448F0U8052, Mileage: Unknown, Color: White, Engine: Electric Motor, 72 Volts, Fuel: Battery...more, Transmission: Automatic, Brakes: Unknown, 6 Capacity, No Charger. 2 Fans Zipper Broken, Seat Torn Odometer may no be accurate. May have defects not easily noticed on a quick inspection. Sold As Is Where Is with No Warranties Expressed or Implied. By Bidding on this item you are agreeing to, and accepting the terms & conditions of this auction. These can be found under the special terms of sale, by clicking the "Terms of Sale" above.